Labor Day weekend in Fort Myers, Fort Myers Beach, and Naples is always a fun time of year as there is a lot to do for all ages. Here are our two main picks for things to do on Labor Day weekend in Fort Myers Beach, Fort Myers, and Naples this year. What better way to enjoy the Gulf Coast than to be on the water! Good Time Charters provides really enjoyable dolphin cruises, fishing charters and more. 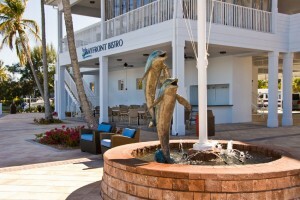 If you would like to enjoy a special lunch or dinner over Labor Day weekend on Fort Myers Beach, there is no better waterside restaurant than the award-winning Bayfront Bistro. The views of the back bay from every seat in the restaurant, both indoor and outdoor, are both beautiful and relaxing and the menu at Bayfront Bistro will delight everyone in the family! Mention Brian Joseph Studios sent you and they will give you $5 off of your bill if it is $30 or more.